Retinoblastoma, the most common primary intraocular malignancy of the young, is a prototype hereditary cancer. Due to its fairly predictable Mendelian inheritance, easily examinable tumors, and early age of presentation, RB has served as the most extensively studied model for genetics in cancer. The genetic strides in RB have progressed at an exponential rate since the 1970s. The highly morbid, reasonably curable and distinctly predictable inheritance pattern of RB; not to mention its propensity to affect our young, forms the basis of aggressively encouraging genetic diagnosis in all patients of RB. In this article, we present the basic and clinically relevant concepts of the genetics retinoblastoma. Aquintessential genetic cancer–Retinoblastoma (RB) is a primary intraocular malignancy of the young; and clichéd as it may seem to say, the most common. With an incidence of around 1 in 16,000 births, it is a relatively rare disease to have been studied so extensively from the genetic perspective. Due to its fairly predictable Mendelian inheritance, easily examinable tumors, and early age of presentation, RB is a prototype study model for genetics in cancer. The genetic strides in RB have progressed at an exponential rate since the 1970s. Management aims in RB have advanced from ensuring the child lives to ensuring the child sees. The genetic era is sure to advance our aim to ensure that a child at risk never develops a clinical tumor using target gene therapies and assuring an RB patient of healthy siblings and offspring using prenatal diagnosis. “Nothing is more powerful than an idea whose time has come,” and in this write-up, we hope to sketch the more basic and relevant ideas in the genetics of RB. Around 400 years ago, a noted anatomist scribbled down notes of a “Tumor oculorum” in a 3-year-old in a dissection chamber in the Netherlands; Petrus Pawius thus documented the first description of RB. The first suspicion of RB being a hereditary disease was raised in 1821 by Lerche, who described a family with four of its seven children affected. In the garden of an obscure Austrian monastery, in 1864, an Austrian monk unearthed the concept of “unit of heredity” quite oblivious to the impact of his discovery. Gregor Mendel's idea was soon forgotten only to be rediscovered in 1962 by Watson, Crick, Wilkins, and Franklin in the form of an image which is a 20th century icon– the double helix of the DNA. An ingeniously simple observation leads to an enigmatic scientific paper in 1971 on the “two-hit hypothesis” for RB. Although the unprecedented suggestion that RB is a recessive disease did not go well with the then researchers Alfred Knudson marked it as the prototype hereditary cancer and set the stone rolling for the genetic basis of many cancers. Kundson's theory bides its time until genetic research manages to catch up with it– Cavalee finally proved beyond doubt the recessive nature of cancer and popularized the concept of loss of heterozygosity (LOH). In 1986, a gene locus linked to RB is identified on chromosome 13;, it was subsequently cloned in the laboratory of Thaddeus Dryja at Harvard Medical School and sequenced. The RB1 gene becomes the first of a series of tumor suppressor genes to be cloned. While the fate map in the form of the Human Genome Project was drafted as the 21st century sets in, so are insights into genomic instability, epigenetics, and prenatal screening of RB. A baby who was destined to be born under a malignant star can be born free of any chance of cancer; the first case of preimplantation diagnosis and embryo selection was successful in 2004. By definition, RB is a tumor arising from retinal precursor cells of neuroectodermal origin due to biallelic inactivation of the RB1 tumor suppressor gene and is capable of local invasion and metastasis. It is found to occur in all races and regions at a fairly constant rate. Nomenclature about RB is often misleading due to its overlapping nature. 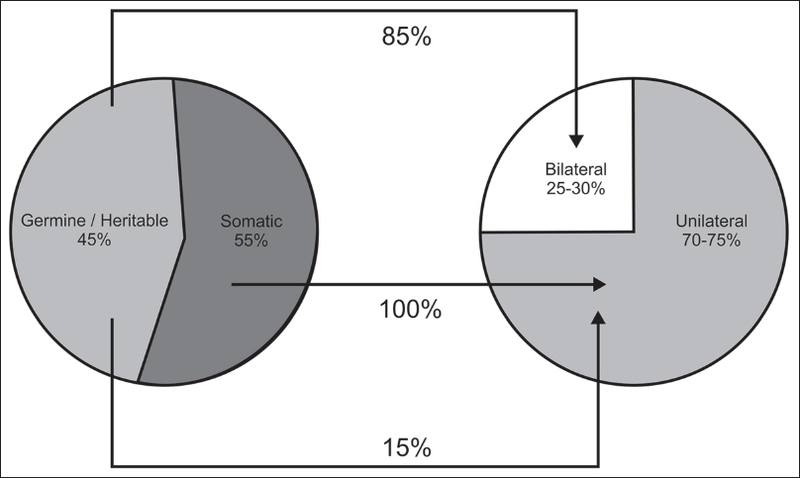 [Figure 1] illustrates the terminology used for description of retinoblastoma. Germline mutations are those that affect the germ cells (cells that are precursors of the sperm and the ova), these mutations affect all cells of the body and are passed on to the offspring. On the other hand, somatic mutations are the ones that occur in any tissue other than the germinal tissue; the retinal precursor cells in case of RB. Somatic mutations cannot be inherited as the somatic cells are never passed on to the progeny. About 45% of RBs are germline or heritable, meaning that the children are born with a single inactive RB1 allele in all cells of their body and need only one more “hit” or event which renders the other RB1 allele inactive in at least one retinoblast. Thus, they develop early, multifocal and bilateral tumors, are susceptible to second extraocular tumors throughout their life and transmit the cancer predisposition trait (RB+/-) to half of their offspring. The other 55% of RB patients have acquired a nongermline or somatic mutation ( first hit) either in utero or soon after birth and they require the second hit in the same retinoblast to develop a tumor. That is why these children develop a single unilateral tumor at a relatively later age and are free from any risk of other cancers linked to RB1. The term “germline” is synonymous with “heritable” in that the tumor is capable of being hereditary, though a tumor is termed “hereditary” or “familial” only if a child has had a pedigree member affected by it. Only 6% of RB patients give a positive family history and can be termed hereditary or familial, the majority (germline or somatic) being sporadic. 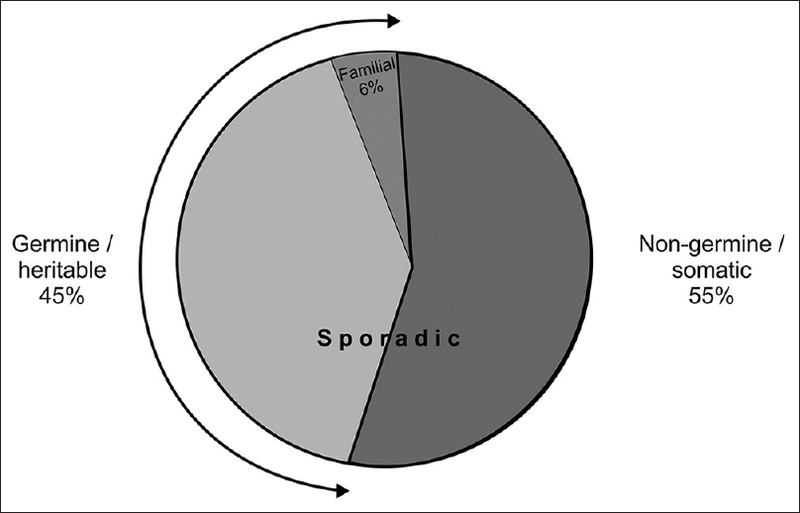 Clinicians often use the term “sporadic” to mean a somatic disease which is not accurate since the majority of the germline tumors are also sporadic (do not have a family history). RB follows a classical autosomal dominant pattern of inheritance, meaning that a person with a germline RB1 mutation has a 50% chance of passing it on to their offspring. It is interesting to note that although it is a dominantly inherited trait, genetically RB is an autosomal recessive disease as it requires both the alleles of RB1 to be nonfunctioning. Simply put, the “cancer predisposition trait” is a dominant one, cancer itself featuring a recessive disease. However, when it translates into phenotype, RB behaves like a dominant disease (half of the offspring developing tumors) because tumor requires a second inactivating mutation in any one retinoblast and this occurs with a 90%–95% probability. Speaking of laterality of the tumors, how and to what extent the genotype influences it is summarized in [Figure 2]. The mean age at presentation is 12 months for bilateral and 24 months for unilateral RB. In developing countries, on an average, the mean age at diagnosis is around 6 months later. RB1 contains 27 exons (coding regions of the DNA) that span 180 kb of DNA. RB1 encodes a 4.7 kb messenger RNA transcript that materializes into a protein of 928 amino acids and 110 kD – the retinoblastoma protein (pRB) [Table 1]. A proto-oncogene is a normal gene which when mutated (up-regulated) predisposes a cell to uncontrolled proliferation. Proto-oncogenes function as dominant genes; they predispose a cell to cancer even when only one allele is mutated. A tumor suppressor gene or anti-oncogene is one whose encoded protein causes a repressing effect on the cell cycle or promotes apoptosis or both. Unlike proto-oncogenes, both alleles of the tumor suppressor genes need to be down-regulated to cause cancer. The RB1 gene is the archetypal anti-oncogene. pRB acts at the G1 checkpoint of the cell cycle, which is an important site as the cells that progress through this checkpoint are obligated to complete the cell cycle. pRB is multifunctional: it binds to E2F transcription factors via its E2F binding sites and to chromatin remodeling proteins histone deacetylases (HDAC) and BRG via the LxCxE binding site. In the dephosphorylated state, pRB inhibits cell cycle progression by two mechanisms:First, it binds E2F transcription factors and inactivates them. Second, it is binds to HDAC and BRG1, which alter chromatin structure and lead to an exit from the cell cycle. When an extracellular signal is received for cell cycle progression, the G1 Cyclin D-CDK complex brings about phosphorylation of pRB. This hyperphosphorylated can no longer bind to either E2F or the chromatin binding factors. E2F thus is freed to the transcript and the cell cycle progresses. Under normal conditions, the cell cycle is exited when pRB is again dephosphorylated via MITF induction of p16. Under conditions of excessive proliferation of cells, there is an apoptotic rescue pathway other than the normal cell exit pathway, which is activated by a change in the tertiary structure of pRB and eventual apoptosis. This rescue pathway may be suppressed by BRCA1 mutations.,, Thus, an absent or defunct pRB leads to uncontrolled proliferation of retinoblasts and a preneoplastic state. How this converts into a full blown malignant tumor is summarized in the next section. LOH is an important concept in the genesis of many cancers and it leads to expression of a recessive trait. It is implicated in 50%–70% of the second hits in RB. Generally speaking, before a cell turns cancerous, it needs to acquire the so-called hallmarks of cancer. These include activation of growth-signaling pathways, evasion of cell death and senescence, acquisition of limitless replicative potential, sustained angiogenesis, and metastasis. Thus, whether a cellular proliferation will turn malignant and the rate at which it grows depends on the rate of acquisition of the further necessary “hits” or genetic lesions. In case of RB, biallelic RB1 inactivation grants limitless replicative potential to the retinal precursor cells, but they are still preneoplastic. Such cells are arrested in the stage of retinoma, a benign precursor of RB. Dimaras et al. examined eyes enucleated for RB for underlying retinoma, and showed the first molecular evidence of progression of senescent retinoma to RB. RB1 gene is known to be essential for chromosomal stability, and RB1 inactivation promotes a state of genomic instability.,, Genomic instability involves various oncogenes and growth signaling proteins, which are elucidated later on, and these confer a malignant potential to the retinoma. On the other hand, p16INK4A, a senescence protein capable of arresting proliferative cell at G1 phase of cell cycle, is over-expressed during the early stages of retinoma. Retinoma remains quiescent till the senescence pathway of p16INK4A is not overwhelmed by the proliferative pressure of the genomic instability. Finally, some cells manage to escape senescence and clonally progress to RB. The above-mentioned genetic lesions are the ones more frequently altered and the focus of research for candidate oncogenes; however, there are several other regions which are altered less frequently, but recurrently. To summarize, tumor proliferation is initiated by RB1 inactivation, but the tumor stays quiescent in the benign state of retinoma until the acquisition of further genetic hits, which lead to progression from retinoma to RB. The rapidity and the nature of the M3 to Mn mutations define the nature of the RB as regard to its aggressiveness. A report by Rushlow et al. suggested that about 2.7% of RBs arise without any evidence of RB1 mutation, that is, they are RB1+/+. Majority of them (52%) were found to have evidence of copy number variation of MYCN in the tumor cells. These genetically unique RB+/MYCNamp tumors are unilateral and present before 12 months, an unusual scenario in case of unilateral tumors. Such tumors thus face a chance of being treated less aggressively by oncologists given an expected bilateral disease, thus exposing the child to a risk of metastasis. Histology of RB+/MYCNamp tumors suggests a higher anaplastic grade with little calcification. Thus, due to its aggressive nature, it is important to not overlook a genetic diagnosis of MYCNamp tumors in a unilateral RB presenting before 1 year of age. Such RBs are nonhereditary, with no risk of extra-ocular primary tumors. Thus, rather than a single causative event, RB is said to have a “genomic lansdcape.” The integrated genetic signature of RB starts with RB1 inactivation, progressing through the multiple genetic hits and various epigenetic mechanisms which endow the tumor with malignant potential and also have an influence on its phenotypic presentation. In contrast to the extensive on-going research in the molecular etiology, there is still not a concord as regards the cell of origin of RB. Xu et al. following immunohistochemical detection of cone-specific markers in all of the 40 RBs examined, put forth a cone photoreceptor cell of origin theory. Another study by McEvoy et al. in 2011, on the basis of gene expression analysis, implicated multiple retinal cell types in the genesis of RB. A recent study utilized gene expression profiling (GEP) of mRNA and comparative genomic hybridization (CGH) of DNA to study 21 RBs. The study group categorized RBs into two types based on their cell of origin: Group 1 tumors expressed genes relevant in early retinal development and thus were consistent with a retinal progenitor cell theory of origin, in accordance with the study by McEvoy et al. Group 2 tumors expressed cone cell genes; these tumors thus were thought of having arisen from cone photoreceptors. Group 1 tumors were thus the more poorly differentiated among the two groups; the clinical significance being they showed a higher propensity to invade the choroid and optic nerve. From a genomic perspective, genetic hits more likely to be associated with unfavorable clinical outcomes such as the gain of 1q or 6p and loss of 16q were more frequent in Group 1 tumors. RB thus shows heterogeneity, and GEP can be harnessed to stratify the tumors as per their cell of origin and to predict their clinical behavior. When a person inherits an inactive RB1 allele but does not develop a tumor clinically, he is said to have 'low penetrance' RB. RB, in general, is highly penetrant-of 50% of the offspring who inherit a RB1 mutation, 45% develop tumors. Thus, the penetrance of RB is 90%. This is because in a germline tumor, only one more RB1 hit is needed in any one cell to trigger cell proliferation, and the frequency of this second hits approximates 90%. Some tumors, however, show a low penetrance pattern that runs in families; they have a preponderance of members who either develop only a unilateral tumor or benign retinoma (reduced expressivity) or are unaffected carriers (incomplete penetrance). Although various mechanisms such as immunologic factors, epigenetics, delayed mutations and even another RB locus have been suggested; most low penetrance phenotypes can be attributed to mutations in the RB1 locus. Rather than a complete loss of function or null mutations, these phenotypes are linked to missense mutations which lead to only a partially inactivated pRB or which reduce the expression of normal pRB. A parent of origin effect has also been proposed. A parent of origin effect has also been reported, in which the mutation when inherited from the father is more prone to manifest as low penetrance retinoblastoma. About 5%–6% of all RBs have some cytogenetic abnormality of chromosome 13. These are usually 13q interstitial deletions or translocations involving 13q. Children with 13q deletion syndrome develop characteristic features like a dysmorphic facies (thick anteverted earlobes, broad forehead, prominent philtrum, short nose and a thick everted lower lip), psychomotor retardation, cardiac and brain anomalies and ocular malformations such as microphthalmos, coloboma, and congenital cataract. The clinical implication of recognizing these unique features is that a child can be subjected to the less expensive karyotype analysis rather than the routine DNA sequencing; also screening for systemic anomalies assumes importance if a 13q deletion syndrome is confirmed. In amphibians, the photoreceptor function and retina-like morphology of the pineal gland led to its designation as a “third eye.” Despite evolutionary changes, the human pineal gland still remains sensitive to light. That is why when Bader et al. reported bilateral RB with pineoblastoma for the first time in 1980, they termed it “trilateral RB” Kivela et al. conducted a meta-analysis of 106 trilateral RBs and defined it as an intracranial neuroblastic tumor associated with bilateral or unilateral RB. These tumors may be located in the pineal gland or in the suprasellar/parasellar region, pineal tumors being more common. The common terminology used today is “primary neuroectodermal tumor” or PNET. The incidence is 5%–13%, and it is particularly high in familial RBs. Thus screening with MRI is more important in familial cases, though the prognosis remains dismal. Survivors of germline RB are at a significant risk of developing nonocular tumors, particularly those who undergo radiation therapy. A study by Abramson et al. reported an incidence of 51% at 50 years in those who underwent radiation and 27% incidence in those who did not. They called these “second primary tumors” to emphasize the fact the tumors were not RB metastases or secondaries but primary tumors in themselves. These tumors have an age-specific distribution: connective tissue tumors (most common being osteosarcoma) in the young, melanoma in middle age and carcinomas in the elderly. Second primary tumors assume importance in counselling of heritable RB families: patients who do not harbor a germline mutation are not at risk of extraocular tumors whether or not they undergo radiation; on the other hand, patients who develop only a benign retinoma are at a similar risk as those with bilateral disease. When an RB1 mutation occurs after the one-celled stage of embryogenesis, only a fraction of all cells of the body are RB+/-. Such a person is said to be a mosaic. A person with RB1 mosaicism may test negative on his blood DNA if the lymphocytes sampled do not harbor the mutation. This is of significance in predicting the risk of RB in the sibling of a bilaterally affected child––parental mosaicism may give a false negative report, and the future sibling of the proband be erroneously declared risk free. Allele-specific polymerase chain reaction (PCR) has excellent sensitivity for this peculiar condition and can detect even 1% mosaicism. Any child with a clinical diagnosis of RB is a candidate for molecular diagnosis. Siblings of germline RB patients should also be offered genetic screening, to avoid the health risks and cost of unnecessary examinations. Parents of a child with RB should undergo genetic testing before planning future pregnancies and if a parent is positive, be offered counselling and prenatal interventions. Molecular diagnosis of a child with the unilateral disease is important since 15% of unilateral RB s are germline. Thus, if the report tests positive in a unilateral RB, it gears the health team up for recurrences and also for second tumors; and thus may avoid a false state of assuredness. On the other hand, if the child with a unilateral tumor is negative for a germline mutation, it may well be free from intensive examinations under anesthesia after the regression of a tumor. It is also essential to draw a genetic diagnosis in bilateral RB to target the same mutation in prospective siblings of the proband. A molecular diagnosis provides a precise risk prediction and reduces the overall health expense and anxiety, as opposed to the conventional screening examinations under anesthesia for babies at risk. After a pretest counselling session, peripheral venous blood is collected and the DNA screened for RB1 mutations. The probability of finding a mutation in a bilaterally affected proband is 97% in an RB1 specialized laboratory with a high degree of sensitivity and turnaround time. In 3% of bilateral RB patients, mutations may not be detected due to low-level mosaicism. For unilateral tumors, the tumor tissue, if available, should be tested for both mutations. Fresh or frozen tumor samples are preferred over formalin-fixed tumors. If one of the two mutations is identified in blood DNA, the germline status is confirmed; if not, the risk of germline disease is reduced to <1%. In case of a rare scenario in which no RB1 mutation is identified in the tumor DNA, MYCN amplification should be looked for in the tumor tissue. 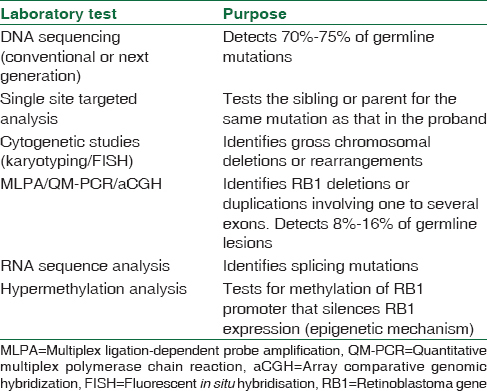 The techniques of RB1 mutation identification are summarized in [Table 3]. Molecular testing can comprise single gene testing or a multi-gene panel. A series of tests are generally offered by specialized laboratories of which, currently, the most efficient way is next-generation sequencing (NGS). 70%–75% of germline mutations are identified by NGS. It is, however, unable to identify large RB1 deletions or duplications. Multiplex ligation-dependent probe amplification, quantitative multiplex PCR or array are used to identify large RB1 deletions. Large chromosomal rearrangements and deletions (as in 13q deletion syndrome) can be picked up by karyotyping or fluorescent in situ hybridization. If no mutations are found by the aforementioned techniques, methylation analysis of RB1 promoter is carried out to identify epigenetic factors. An exhaustive counselling session can make all the difference not only in the management of the child diagnosed with RB but also its parents and present or prospective siblings. Furthermore, an increasing spectrum of reproductive options available today for the parent with a germline mutation makes genetic counselling truly worthwhile. In general, a pretest counselling session is carried out after the initial diagnosis, the objectives being to communicate the genetic nuances of cancer, to draw up a pedigree chart and predict the risk of future generations, to convey the risk of second cancers and to offer genetic testing. The purpose, cost, risk-benefit ratio, and likelihood of false-negative results of the genetic tests should be meticulously discussed with the parents. The genetic testing is then offered to the patients and carried out with their consent. A posttest counseling session is scheduled for communicating the results; and discussing its implications and further management options. A consensus report about the surveillance strategies of “high risk” babies was published by a group from the American Association of Ophthalmic Oncologists and Pathologists; high risk being defined as a baby with a family history of RB in a parent, sibling or first- or second-degree relative. The surveillance plan for different clinical and genetic scenarios is summarized in [Table 4]. Due to increased survival rates, more and more adult RB survivors are opting to have a family. For a parent with a confirmed RB1 mutation, in utero molecular diagnosis can be offered by amniocentesis performed during the second trimester of pregnancy. Single site targeted mutation analysis can be performed in the fetal DNA. If tested negative, it helps to lessen the anxiety of the family and avoid future examinations of the infant. If positive, the couple has a chance to decide about the continuation of pregnancy. If a decision is made to continue the pregnancy, intensive clinical examinations starting right at birth; or serial ultrasounds during the third trimester and elective delivery at the first evidence of tumour can be carried out.,, Soliman et al. proposed an elective early full-term delivery at 36–38 weeks of gestational age in fetuses with a germline mutation, to diagnose the tumors when small and hence more amenable to focal therapy. They reported a significantly better visual outcome and avoidance of systemic chemotherapy and enucleation in the majority of the babies delivered and treated early. A concern with early elective delivery may be its effect on the neuro-cognitive development of the child; though blindness, repeated examinations under anesthesia and radiation can affect it as well. Preimplantation genetic diagnosis (PGD) has ushered in a new era in the molecular diagnosis of RB; RB being the first ocular disease in which PGD has been reported. Embryos are generated by in vitro fertilization, the DNA from each blastomere is extracted and screened for mutations, and the healthy embryos are implanted in the uterus. The first case of a healthy infant born thusly was reported by Xu et al. Advantages of PGD over prenatal screening include ensuring not only a risk-free baby right at the outset of pregnancy but also cleansing the future generations of the mutation. Furthermore, it helps avoid distressing decisions such as termination of pregnancy or early induced delivery. Although its inaccessibility is a problem today; the health-related, psychosocial and overall financial advantages PGD offers are sure to make it a forerunner in the management of familial RB in the near future. In 2017, the American Joint Committee on Cancer acknowledged the major role of heritability in the surveillance plan and prognosis of RB by incorporating an additional “H” factor in the traditional tumor node metastasis staging scheme. RB thus became first cancer to have a genetic diagnosis linked to its staging. The highly morbid, reasonably curable and distinctly predictable inheritance pattern of RB; not to mention its propensity to affect our young, forms the basis of aggressively encouraging genetic diagnosis in all patients of RB. Parents should be explained the overall financial advantage of opting for genetic testing. Genetics is fast becoming a therapeutic tool in RB management in the form of targeted gene therapy, biomarkers for predicting metastasis risk and prenatal diagnostic techniques. Since genetics forms the essence of this cancer, it is worthwhile to have a thorough knowledge of its working and to urge parents to opt for genetic counselling and molecular diagnosis for timely treatment, for avoiding unnecessary expenditure and anxiety, and for a finer quality of life of the RB warrior. Dimaras H, Corson TW, Cobrinik D, White A, Zhao J, Munier FL, et al. Retinoblastoma. Nat Rev Dis Primers 2015;1:15021. Soliman SE, Racher H, Zhang C, MacDonald H, Gallie BL. Genetics and molecular diagnostics in retinoblastoma – An update. Asia Pac J Ophthalmol (Phila) 2017;6:197-207. Thériault BL, Dimaras H, Gallie BL, Corson TW. 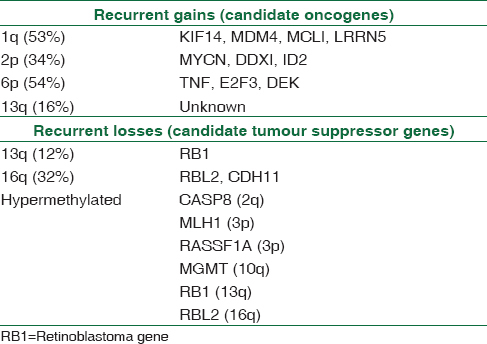 The genomic landscape of retinoblastoma: A review. Clin Exp Ophthalmol 2014;42:33-52. Albert DM. Historic review of retinoblastoma. Ophthalmology 1987;94:654-62. Mukherjee S. The Gene. India: Penguin Books; 2016. Cavenee WK, Hansen MF, Nordenskjold M, Kock E, Maumenee I, Squire JA, et al. Genetic origin of mutations predisposing to retinoblastoma. Science 1985;228:501-3. Dryja TP, Friend S, Weinberg RA. Genetic sequences that predispose to retinoblastoma and osteosarcoma. Symp Fundam Cancer Res 1986;39:115-9. Lalande M, Dryja TP, Schreck RR, Shipley J, Flint A, Latt SA, et al. Isolation of human chromosome 13-specific DNA sequences cloned from flow sorted chromosomes and potentially linked to the retinoblastoma locus. Cancer Genet Cytogenet 1984;13:283-95. Lee WH, Bookstein R, Hong F, Young LJ, Shew JY, Lee EY, et al. Human retinoblastoma susceptibility gene: Cloning, identification, and sequence. Science 1987;235:1394-9. Grossniklaus HE. Retinoblastoma. Fifty years of progress. The LXXI Edward Jackson memorial lecture. Am J Ophthalmol 2014;158:875-91. Kim JW, Mansfield NC, Murphree AL. Retinoblastoma. In: Schachat AP, editor. Ryan's Retina. 6th ed. Edinburgh: Elsevier; 2018. p. 2375-412. Shanmugam MP, Biswas J, Gopal L, Sharma T, Nizamuddin SH. The clinical spectrum and treatment outcome of retinoblastoma in Indian children. J Pediatr Ophthalmol Strabismus 2005;42:75-81. Hong FD, Huang HJ, To H, Young LJ, Oro A, Bookstein R, et al. Structure of the human retinoblastoma gene. Proc Natl Acad Sci U S A 1989;86:5502-6. Goodrich DW. The retinoblastoma tumor-suppressor gene, the exception that proves the rule. Oncogene 2006;25:5233-43. Leiderman YI, Kiss S, Mukai S. Molecular genetics of RB1 – The retinoblastoma gene. Semin Ophthalmol 2007;22:247-54. Valverde JR, Alonso J, Palacios I, Pestaña A. RB1 gene mutation up-date, a meta-analysis based on 932 reported mutations available in a searchable database. BMC Genet 2005;6:53. Dryja TP, Morrow JF, Rapaport JM. Quantification of the paternal allele bias for new germline mutations in the retinoblastoma gene. Hum Genet 1997;100:446-9. Toriello HV, Meck JM; Professional Practice and Guidelines Committee. Statement on guidance for genetic counseling in advanced paternal age. Genet Med 2008;10:457-60. Cavenee WK, Dryja TP, Phillips RA, Benedict WF, Godbout R, Gallie BL, et al. Expression of recessive alleles by chromosomal mechanisms in retinoblastoma. Nature 1983;305:779-84. Jagadeesan M, Khetan V, Mallipatna A. Genetic perspective of retinoblastoma: From present to future. Indian J Ophthalmol 2016;64:332-6. Ramprasad VL, Madhavan J, Murugan S, Sujatha J, Suresh S, Sharma T, et al. Retinoblastoma in India: Microsatellite analysis and its application in genetic counseling. Mol Diagn Ther 2007;11:63-70. Dimaras H, Khetan V, Halliday W, Orlic M, Prigoda NL, Piovesan B, et al. Loss of RB1 induces non-proliferative retinoma: Increasing genomic instability correlates with progression to retinoblastoma. Hum Mol Genet 2008;17:1363-72. Manning AL, Longworth MS, Dyson NJ. Loss of pRB causes centromere dysfunction and chromosomal instability. Genes Dev 2010;24:1364-76. Hernando E, Nahlé Z, Juan G, Diaz-Rodriguez E, Alaminos M, Hemann M, et al. Rb inactivation promotes genomic instability by uncoupling cell cycle progression from mitotic control. Nature 2004;430:797-802. Corson TW, Gallie BL. One hit, two hits, three hits, more? Genomic changes in the development of retinoblastoma. Genes Chromosomes Cancer 2007;46:617-34. Laurie NA, Donovan SL, Shih CS, Zhang J, Mills N, Fuller C, et al. Inactivation of the p53 pathway in retinoblastoma. Nature 2006;444:61-6. Rushlow DE, Mol BM, Kennett JY, Yee S, Pajovic S, Thériault BL, et al. Characterisation of retinoblastomas without RB1 mutations: Genomic, gene expression, and clinical studies. Lancet Oncol 2013;14:327-34. Zhang J, Benavente CA, McEvoy J, Flores-Otero J, Ding L, Chen X, et al. Anovel retinoblastoma therapy from genomic and epigenetic analyses. Nature 2012;481:329-34. Greger V, Passarge E, Höpping W, Messmer E, Horsthemke B. Epigenetic changes may contribute to the formation and spontaneous regression of retinoblastoma. Hum Genet 1989;83:155-8. Ohtani-Fujita N, Fujita T, Aoike A, Osifchin NE, Robbins PD, Sakai T, et al. CpG methylation inactivates the promoter activity of the human retinoblastoma tumor-suppressor gene. Oncogene 1993;8:1063-7. Xu XL, Fang Y, Lee TC, Forrest D, Gregory-Evans C, Almeida D, et al. Retinoblastoma has properties of a cone precursor tumor and depends upon cone-specific MDM2 signaling. Cell 2009;137:1018-31. Kapatai G, Brundler MA, Jenkinson H, Kearns P, Parulekar M, Peet AC, et al. Gene expression profiling identifies different sub-types of retinoblastoma. Br J Cancer 2013;109:512-25. Mallipatna A, Marino M, Singh AD. Genetics of retinoblastoma. Asia Pac J Ophthalmol (Phila) 2016;5:260-4. Baud O, Cormier-Daire V, Lyonnet S, Desjardins L, Turleau C, Doz F, et al. Dysmorphic phenotype and neurological impairment in 22 retinoblastoma patients with constitutional cytogenetic 13q deletion. Clin Genet 1999;55:478-82. Bader JL, Miller RW, Meadows AT, Zimmerman LE, Champion LA, Voûte PA, et al. Trilateral retinoblastoma. Lancet 1980;2:582-3. Kivelä T. Trilateral retinoblastoma: A meta-analysis of hereditary retinoblastoma associated with primary ectopic intracranial retinoblastoma. J Clin Oncol 1999;17:1829-37. Bader JL, Meadows AT, Zimmerman LE, Rorke LB, Voute PA, Champion LA, et al. Bilateral retinoblastoma with ectopic intracranial retinoblastoma: Trilateral retinoblastoma. Cancer Genet Cytogenet 1982;5:203-13. Abramson DH, Ellsworth RM, Zimmerman LE. Nonocular cancer in retinoblastoma survivors. Trans Sect Ophthalmol Am Acad Ophthalmol Otolaryngol 1976;81:454-7. Korswagen LA, Moll AC, Imhof SM, Schouten-van Meeteren AY. A second primary tumor in a patient with retinoma. Ophthalmic Genet 2004;25:45-8. Skalet AH, Gombos DS, Gallie B, Kim JW, Shields CL, Marr BP, et al. Screening children at risk for retinoblastoma. Consensus report from the American Association of Ophthalmic Oncologists and Pathologists. Ophthalmology 2018;125:453-8. Rothschild PR, Lévy D, Savignoni A, Lumbroso-Le Rouic L, Aerts I, Gauthier-Villars M, et al. Familial retinoblastoma: Fundus screening schedule impact and guideline proposal. A retrospective study. Eye (Lond) 2011;25:1555-61. Lohmann DR, Gallie BL. Retinoblastoma. Gene Reviews. Available from: https://www.ncbi.nlm.nih.gov/books/NBK1452/#!po=1.56250. [Last accessed on 2018 Mar 22]. Paquette LB, Miller D, Jackson HA, Lee T, Randolph L, Murphree AL, et al. In utero detection of retinoblastoma with fetal magnetic resonance and ultrasound: Initial experience. AJP Rep 2012;2:55-62. Shah PK, Sripriya S, Narendran V, Pandian AJ. Prenatal genetic diagnosis of retinoblastoma and report of RB1 gene mutation from India. Ophthalmic Genet 2016;37:430-3. Soliman SE, Dimaras H, Khetan V, Gardiner JA, Chan HS, Héon E, et al. 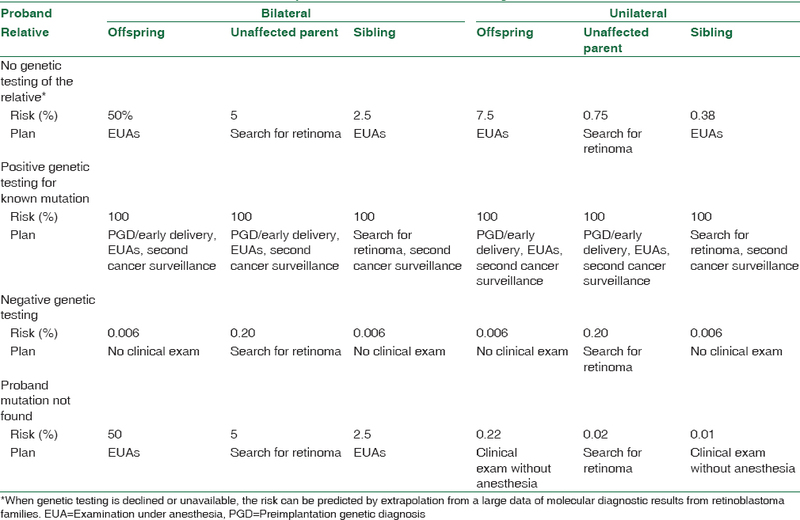 Prenatal versus postnatal screening for familial retinoblastoma. Ophthalmology 2016;123:2610-7. Mallipatna AC, Gallie BL, Chévez-Barrios P, Lumbroso-Le Rouic L, Chantada GL, Doz F, et al. Retinoblastoma. In: Amin MB, Edge SB, Greene FL, Byrd DR, Brookland RK, Washington MK, et al., editors. AJCC Cancer Staging Manual. 8th ed. New York: Springer; 2017. p. 819-31.